Get ready to induct NZ-based Grrlfriendz into your musical girl gang. On our site, we all talk about girl power a lot. I bet you have had enough girl power that you don't know what to do with it all and you’re probably trying to sweep it all under the rug in your bedroom because your shelves are already crammed full of it. But last month, we found three girls – Tonya, Annabel and Sophia – who must have been busting to shove their talent into our lives. The punk trio released my inner Riot Grrrl’s soundtrack and it radiates so much leather-jacket-over-the-shoulder-while-you-skateboard-through-the-suburbs-as-the-sun-goes-down-coolness that I don’t know how I'm going to squash it into my bedroom. 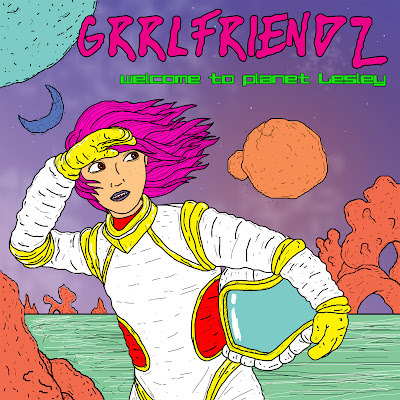 But, I’m going to have to make room for it, because Grrlfriendz’s latest LP is incredible and lives up to the expectation regardless of my clumsy imagery. Grrlfriendz is a New Zealand-based punk band who released their debut LP – Welcome to Planet Lesley – this October. The album is nine tracks long and mega fast-paced, with all three girls dividing vocal responsibilities between them with riot-driven shrieks that sound like they’re bursting out of a 9-year-old who was just told she can’t pursue her life-long goal of being an astronaut because she’s just a girl. This LP is full of ups and downs, ranging from giving me thrills tough enough that I could kick a door down to falling to my feet thirty seconds later in a daze; probably day-dreaming about the boy they’re singing about in the third track, aptly titled "Boy". With the trio’s thoughts out on display in such a spiral, this album is letting us all know that Grrlfriendz are here to make us feel totally okay about our mood swings and our hormones that sometimes we can’t help let override everything from time to time. But you can rely on these girls to stick around to pump that power back into you afterwards to boost you back up again, and Grrlfriendz do exactly that with this album; leaving my heart thumping until the very last track. I’ve gift-wrapped my heart and it’s going to Grrlfriendz this Christmas; these guys have totally earned my love with this LP, and I’m sure they’ll drag yours out of you, too. Listen to more Grrlfriendz on bandcamp.